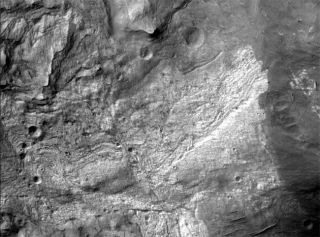 The first image from HiRISE reveals a small portion of the floor of Ius Chasma, one branch of the giant Valles Marineris system of canyons on Mars. The MRO spacecraft was about 174 miles (280 km) above the Martian surface when this picture was taken. New images from a low-altitude Mars satellite are giving scientists some of their most detailed glimpses yet of the surface of the Red planet. The High-Resolution Imaging Science Experiment (HiRISE) camera flying aboard NASA's Mars Reconnaissance Orbiter (MRO) has beamed to Earth its first image of the Martian surface, revealing in never-seen-before clarity Ius Chasma, a complex floor that is part of the giant canyon system Valles Marineris. Within moments of the image being beamed back, researchers said they had identified many boulders, craters and channels. "We are elated at the sharpness of the image, revealing such fine detail in the landscape," said Alfred McEwen of the University of Arizona's Lunar and Planetary Laboratory. The HiRISE team, led by McEwen, has been working at top speed to prepare for the low-orbit images they'll get between today and Oct. 6. Last March, the telescopic camera snapped test images of the Martian surface from a distance of 1,600 miles above the planet as the orbiter settled into a circular orbit around the planet. The newest images will have 10 times the resolution of the ones taken last March. One of the objectives of the MRO mission is to search for evidence of long-standing bodies of water on the Martian surface, so having detailed images of the planet will be important. Other Mars missions have found signs that water once flowed across the Martian surface, suggesting the possibility of subsurface water and perhaps even surface lakes and oceans. But whether water stuck around long enough to provide habitat for life has remained a mystery. The bus-sized MRO launched on Aug. 12, 2005 and settled into its final orbit on Sept. 11, 2006. It now circles near Mars' north and south poles and at times gets as close as 155 miles of the planet's surface. With the craft's six instruments, including HiRISE, team members hope to study the Martian surface, atmosphere and signs of underground water and ice deposits. The first image of Ius Chasma was taken at a local Mars time of 3:30 p.m. and illustrated Mars-shaping processes, including bedrock exposures of layered materials, which could be sedimentary rocks deposited in water or from the air. Many more images are expected as the MRO automatically steers itself to about 40 designated targets, which include the north polar cap and the Phoenix Mission landing region. NASA's Scout-class Phoenix Mission is expected to launch in August 2007 and touchdown near Mars' polar region in May 2008. "HiRISE's best chance for photographing candidate Phoenix mission landing sites is in October and November because the sun is getting lower as northern Mars moves into fall," McEwen said. Fogs and hazes will likely degrade viewing by early 2007, he added.